Built during the reign of Mughal Emperor Bahadur Shah Zafar by Nawab Shah Jahan Begum through 2 generations (continued to be built by her daughter Sultan Jahan Begum), the Taj-ul-Masajid translates to ‘Crown among Mosques’. The gratifying title stays true even today and the mosque is one of the largest Mosques in India! A design much ahead of its time (mid to late 19th century), the architecture of the mosque is truly stunning with intricate wall art, high arches, 18-storey high minarets that touch the gorgeous sky and classic use of marble that adds to its grace. Entry to the mosque however, is not allowed to non-Muslims on Fridays. People normally club together Shaukat Mahal and Gohar Mahal while planning their visit to Taj-ul-masajid. Largest mosque of Asia. This is a very beautiful mosque. 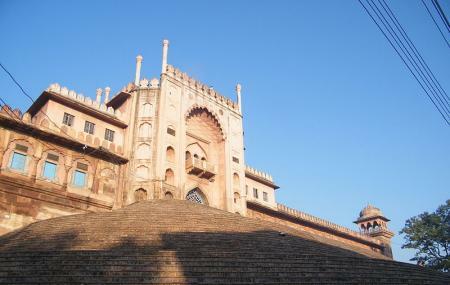 Whoever is in Bhopal, should definitely visit this monument. It has 3 entrance gates, but entry can be made from one gate only. Located on a water body, so cool breeze is always coming. The mosque is just wonderful. Such a peaceful place it is. The art work on the mosque is amazing and it is quite wide spread, it also has a lawn in it. This place is much visit mosque in Bhopal. Beautiful place. Love the environment. Such an amazing experience. And get to know the amazing story by guide. It's a place of worship. A historical mosque. Nothing here for tourists or non Muslims I'd say. Getting entry for non Muslims can be difficult.